LOVE IT! As the writer of a blog based on the idea of trying new things, this totally appealed to me. For the first week, I decided I would step out of my comfort zone by trying a new exercise class: ZUMBA! I've written before about my love for group fitness classes and tips for entering a new class for the first time (see that post here). I dared you to, and now it was my turn to do so, as well. I've watched the Zumba class wrap up (often going overtime, grr) in my gym while I wait to enter Pilates. This week, I put myself on the other side of the glass window. Time to get dancing. In I went. Took my spot, listened to the music, watched the instructor, and got my groove on. I really enjoyed the warm up; it felt good to just dance like no one's watching. (It did, however, take a lot of courage to just let loose and pretend no one could see me.) But fun! Great! I enjoyed! Then, I got a little bored. Sorry to admit it, but I did. Not that it was "easy" or "slow," but I simply felt neither entertained nor challenged, and I find that my workout needs at least one of those elements to keep me engaged. I think that if the instructor had played more music that I knew and/or liked, it would have made ALL the difference in the world. But I know, Zumba's all about the Latin music and moves, and that's fine. Maybe from here on out I can rock it out in my bedroom with the music blasting? What I did realize very quickly: to maximize this workout, really shake your booty. The instructor isn't swaying her hips and shimmying her shoulders just to look cute; these small additions to the dance moves burn extra calories. There's a reason why she's dripping in sweat and many participants are not. If you want to really feel the burn, to really get your heart rate up, move as much as possible. It doesn't matter if you aren't the best dancer or can't get the shimmy quite right; do what you can, but as much as you can. Really. Anyway, I'll definitely be going back at least once more. I want to go in wearing my heart rate monitor so I can see what kind of conditioning I'm actually getting. When I do, I will report back! Either way, it felt good to try something new and break out of my comfort zone. 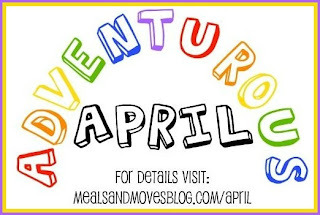 So far, Adventurous April is off to a smashing success! Have you done Zumba? Thoughts? I have a friend that is obsessed and I do like dancing, so I'll give it a few more tries, maybe different instructors. Still, I'd love to know what you think! What can you do to be adventurous this week? Dare you to join in the fun and try something new! Check out these blogs: Liebster Awards!